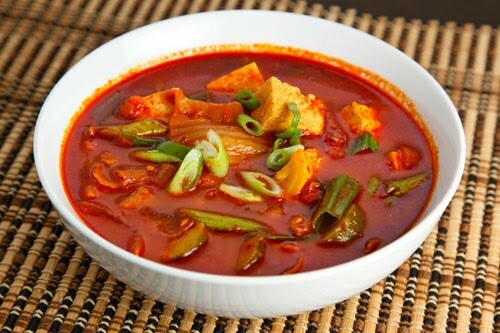 I was searching the web for recipes that used kimchi and I found several for Kimchi Jjigae or kimchi stew. The main recipes that I found were for pork and kimchi stew. I saw some variations of this dish that replaced the pork with canned tuna (which sounds good) and and some that used tofu in addition to the pork. Many of the recipes called for gochujang which is a spicy Korean condiment made of fermented soy beans, rice and chili powder. Keep in mind that both the kimchi and the gochujang are spiced with chili powder so be careful with the amounts that you use if you do not like it really hot. This stew was pretty easy to make and it was really tasty. I have really enjoyed the few Korean dishes that I have tried so far. I am going to have to start looking for a Korean cookbook. Heat the oil in a large sauce pan. Add the pork and saute until it is no longer pink, about 5-7 minutes. Add the kimchi and water bring to a boil. Mix in the gochujang and gochugaru and simmer for 20 minutes. Add the tofu, onion, zucchini and chilies and simmer until tender, about 5 minutes. Remove from heat and add the green onions. What a delicious picture. This dish definitely looks like something to try. Kevin, your cooking is soooo good! Kevin, that looks so good! I can see the richness of the broth! I’ve had the sniffles all day and this sounds like the perfect cure. I think I’m going to make it for breakfast! i know this is fatty but thick pork belly (sam gyup sahl) is tasty for kimchi jiggae. on the lighter side, tuna is good too. Pork belly (sam gyub sal as mentioned above) is a must. Render the fat out of it, add the garlic and ginger and gochujang (I add a bit more than 1Tbsp for added richness) and the kimchi, and then I top off with kimchi juice and Dashida (the common Korean beef stock from powder)… towards the end of cooking I add some rice cake slices, a tiny bit of soy sauce, then add the tofu in chunks, green onions, and spicy Korean green chili slices at the end, cook just til the tofu is done, and then add sesame seed oil. Pretty similar to Kevin's, but with the different stock as I prefer to keep my kimchi jjigae all-meat. Drew: Thanks for the tips! I will have to try it that way next time. I am a huge fan of kimchi and Korean food – this looks like a great recipe. Really nice blog. I love to see this recipe. since I'm a muslim and we don't eat pork, so what best meat do you think I can use to substitute the pork belly? mia: With the tofu in the stew you could easily just skip the pork but if you want to have a meat then chicken would work. Kevin, I love the fact that you make Korean food, but I have to tell you that you should probably reconsider adding gochujang to kimchi jjigae. I say this b/c I learned how to make kimchi jjigae from a real Korean grandmother (I'm Korean American). If you want to make it really authentic, you should add "gochu-kkaru" (which is the red pepper flakes) instead of gochujang; that is what Koreans use to make it spicier. Gochujang is a marinade that generally goes into other stews, daeji bulgogi, etc. but usually never in kimchi jjigae. Also, you should probably cook the pork and kimchi at the same time so that the kimchi retains its integrity (meaning, retains the juices). The pork fat will flavor and cook the kimchee nicely. If you just add water and boil the kimchi instead of cooking it first, it saps the kimchi of all its juices so that it turns white. You want your kimchi to look cooked, not blanched. I love your blog and I support your culinary endeavors! Keep up the good work! Anonymous: Recently I have sauteing the kimchi along with the pork in a few dishes that use both. I will definitely be doing this in the next batch of kimchi jjigae that I make. Thanks for the tips. If you cannot eat pork, another authentic alternative is a can of tuna. Chicken or shrimp in kimchi jjigae sounds strange..
One of my tricks in Kimchi Jigae is adding a tablespoon or two of miso to the broth. It adds a depth of flavor that makes it over-the-top good! Vijay: Good tip! Miso adds such depth of flavour to soups and stews like this!